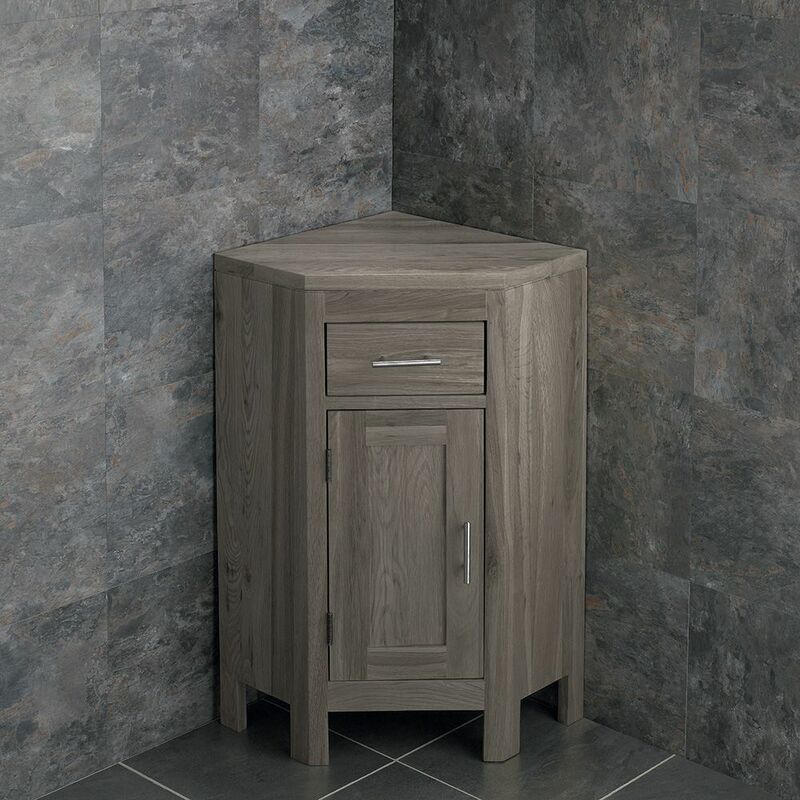 Add a touch of luxury and style to your ensuite or bathroom today with this beautifully handcrafted solid oak GREY WASH Alta single door corner freestanding basin unit that comes pre-assembled from Clickbasin. This unit is perfect if you have a smaller space, however retains all the exceptional style and quality finishing of our larger oak units. 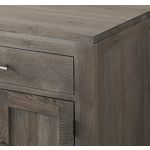 Perfect for a busy family bathroom, this solid oak unit has been given a durable, GREY WASH finish which acts to protect the solid oak wood from the rigours of everyday bathroom use by children and adults alike. 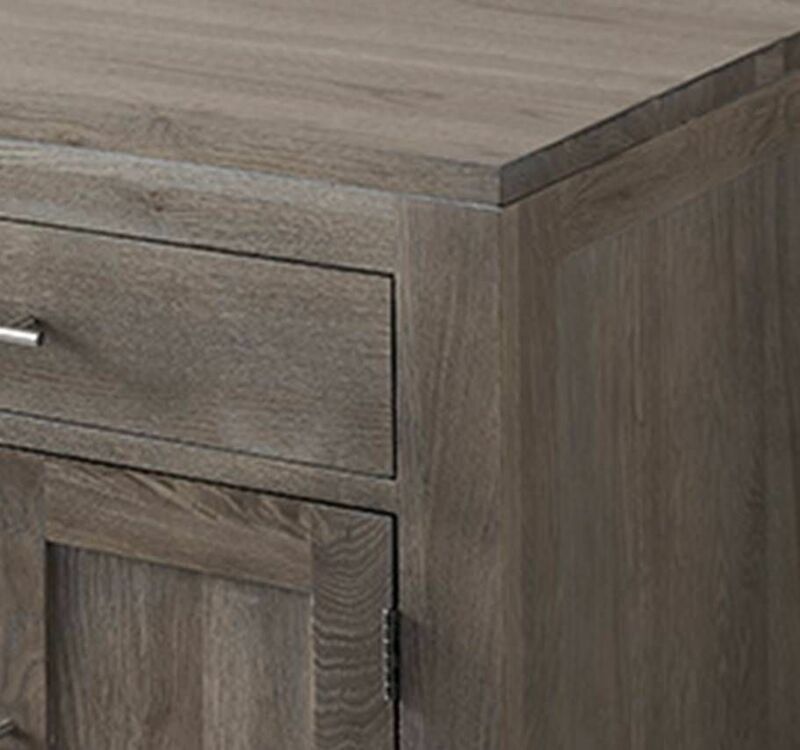 When you order this premium quality solid oak unit, it will be carefully packaged and delivered right to your door – Free of Charge. This unit comes ready assembled, meaning all you need to do is choose a basin and tap, install and connect the plumbing. Different basin options can be used with this cabinet, if you do require the cabinet with a basin please e mail us or call us so we can confirm its suitability.. Items under 30kg: Bathroom Basins, Cloakroom Oak Cabinets, Mirrors and Wall Units. Despatched next working day following order being placed. Fully trackable. Free Delivery: Delivered within 24 / 48 hours of dispatch via Yodel anytime between 8am and 8pm Monday to Friday. Next Day Delivery: £6.99 Available for Orders placed before 12 Noon. DPD will email/text with a one hour timeslot on the morning of delivery. Saturday Delivery Option: £8.49 Available for Orders placed before 12 Noon. Items over 30kg: Large Oak Cabinets over 60cm Wide, Echo Basin and Deco or Leno Wall Hung Cabinets. Clickbasin Customer Services will ring to confirm your preferred delivery date as the item needs to be checked and signed for on delivery. Please call us on 01772 671354 to discuss any special requirements you may require and we will do our best to assist you with these. A Change to your Order or Cancellation prior to goods being dispatched is not a problem. Please let us know before 11am if you have changed your mind. If the goods have not been dispatched, we will action the refund in full or change your order.